Cat Blogs. Cat Blog. Sick kitten in a barn. A matter of life or death. Diary blogs. Thoughts about life, making a difference. 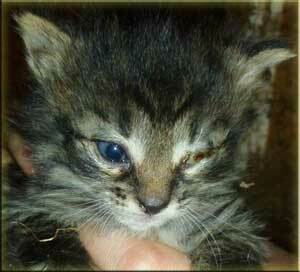 Sick kitten in a barn, eyelids gummed shut. Diary blogs. Thoughts about life, making a difference. There are 2 three-week old kittens in my bathroom. It was a matter of life or death. Their eyes were glued shut, their eyelids gummed together. In my bathroom, I put drops in their eyes, clean their eyes. Yesterday, the first couple of times, their eyelids glued back shut. Now, less than a day later, the eyes stay open. I will return the kittens to their litter mates later today - back to the neighbor's barn where they're living. Where they most likely would have died within a couple of days. It's little Laura Marie, 11, from next door, who noticed and asked me if there was something I could do. Soon I will try to find homes for them. First, I'm doing my best - with a few eye drops - to save their tiny lives. It isn't just the eyedrops that made the difference. As the old saying goes, this is a story with a very long tail. I've known Laura Marie and her family for more than 10 years. They all know I care about animals. I've found homes for kittens before. And when they decided they didn't want their dog, I was happy to give him a home. So when Laura Marie noticed that the kittens had their eyes glued shut, she knew she could call on me, and I would help if I could. As for caring about kittens, Laura Marie's big sister, Elisabeth, who is now off at college, cared about animals years and years ago. Maybe Laura Marie would have been an animal lover without that - but I'm sure it helped, having a big sister who cared. Cat blogs. Nothing new for this cat lover. Click here for stories about her own cats. Timothy Cat, a cat who was rescued.